When you've tried as many kinds of salmiac as I have, you start to notice patterns. I mean, they're all bad, but they all fit into their own category of bad.There's the hard-candy-that-calls-itself-hot-but-really-isn't kind, the sticks-to-your-teeth-so-the-awful-never-goes-away kind, the saltlick-licked-by-a-deer kind, and so on. 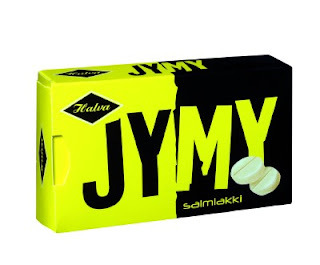 So, when I saw the Apteekkarin Salmiakkipastilli, I had a pretty good idea what I was getting into from my Apteekkarin Pehmeä Salmiakkipastilli review and thought it'd be a great candy to share with my friends. I was expecting basically the same thing, just without the "Pehmeä". Of course, I'm not sure what "Pehmeä " means, but I figured it's either "menthol" or "yellow packaging". This is what I found inside. 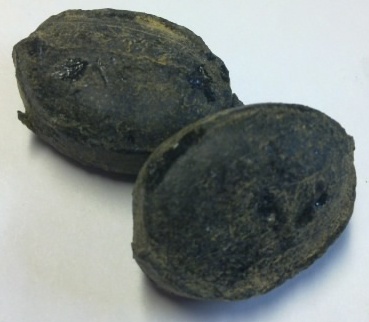 The candies looked like your typical hard candy, but they had a slightly rubbery texture. 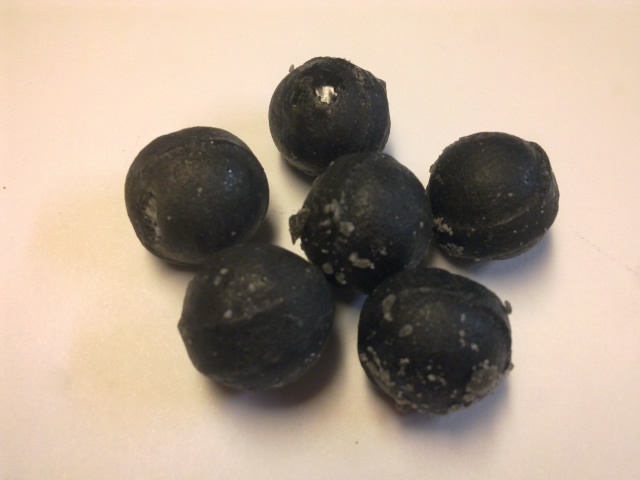 Not squishy rubber, more like the rubber on running tracks - or even asphalt on a hot day. "They look like rabbit terds," one of my friends added before taking a whiff of one, "doesn't have much of a smell, though." The taste wasn't very intense - in fact, it was fairly subtle. At least, until getting past the outer coating. The middle had quite the kick, but not nearly as strong as some of the Tyrkisk Peber I've tried. It was tolerable, but not something anyone would want to keep eating any longer than they had to. And as such, this earns the almost edible rating. On the sidebar, there's a box that lists the ratings I've used for reviews on Salmiyuck. And since they're used to describe different kinds of salmiac, obviously they're all synonymous with "bad". But after experiencing Fazer's Missä X, the Salmiyuck rating scale will be broken forever. The word "experience" truly does describe what eating Missä X is like. It's more than tasty, more than delicious, it was... delightful. In fact, so much so that I had to carefully review the packaging to make sure that Missä X was, in fact, salmiac. Missä X's texture is much like other jelly-based salmiac and, like many of the mixes, each color is a different flavor. The coating is most certainly a mix of sugar and salt - actually, it's the perfect mix. There's even a bit of sour (or maybe it was just the salt), that seemed to tie everything together. This high opinion isn't just my own - I was amongst friends when I opened the Missä X, and they too were delighted. "This stuff is incredible," one friend said, "and they're even better when you combine the different pieces!" 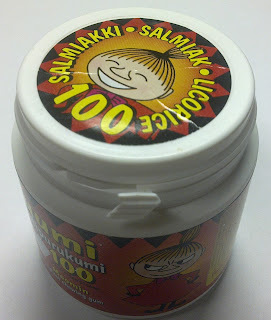 "I'd absolutely buy this," another said, "Finland should totally open a store in America. Or at least, sell this at movie theaters." 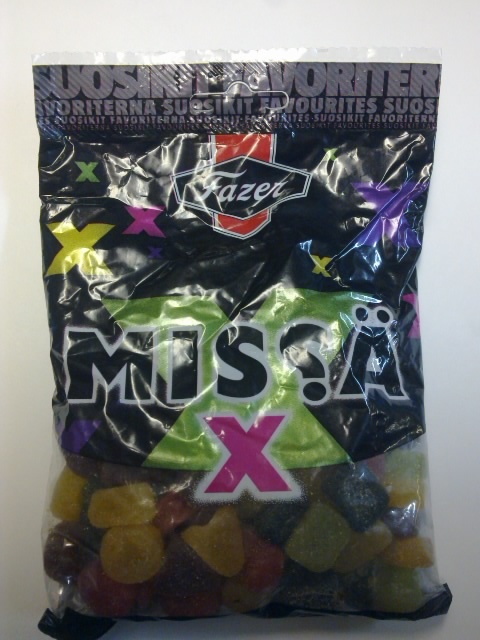 Even with the inedible black pieces, the Missä X earns the rating-system-breaking rating of absolutely delightful. I've been out of town for quite a many weeks, but returned home last week for the Thanksgiving holiday to visit with friends, family, and unfortunately some Salmiac. 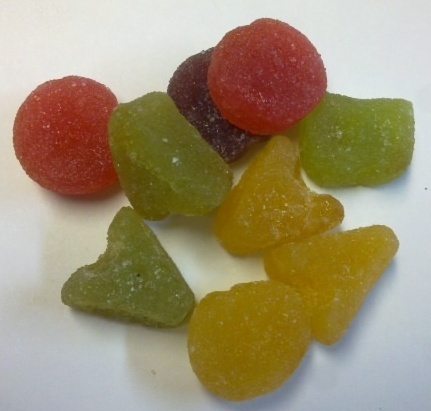 Although my friends are wary to taste anything I give them after suffering through Dracula Piller, they had all drank enough to be willing to try not just one, but three different Salmiac candies. 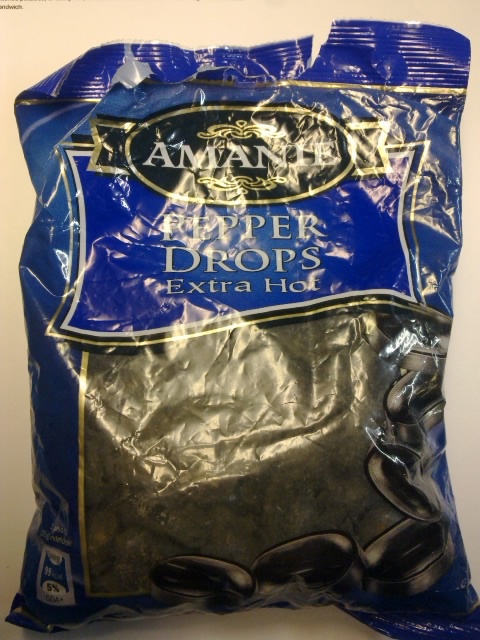 The first one I opened up was Amanie's Extra Hot Pepper Drops. "You denounced an entire country based on this stuff?" my friend Dan commented as he picked up a piece, "it doesn't smell that bad." 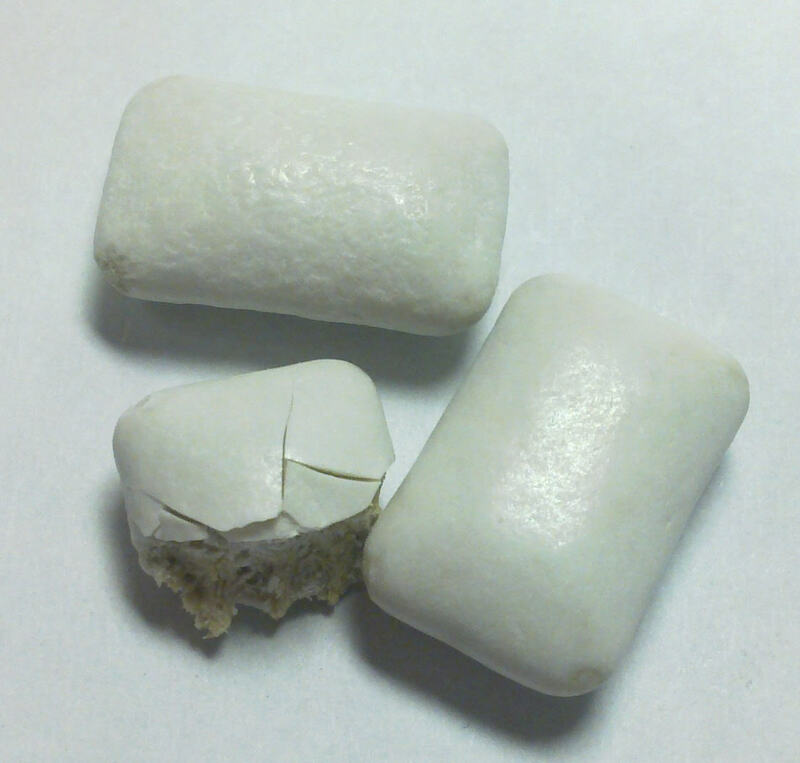 He then popped the piece in his mouth, and I had one as well. Although my Salmiac palate is much more refined than most of my peers, it doesn't take a connoisseur to recognize bad. After sucking on the pepper drop for about a minute, he couldn't take it anymore and spit it out. I held on a little bit longer and asked what he thought of it. "The taste was good for a second—"
"Wait," I interrupted, "did you say good?" "Err, I should say, good by comparison. It was somewhat normal, and then it started... uhh... leaking a bad flavor." Clearly, Dan was unprepared for powdered yuck found in the center of most of these pepper drops. I enquired further, asking what the flavor was like. "It's hard to say... salty battery acid?" That sounded about right. The battery acid taste started getting to me as well, so I spit the pepper drop out and chased the flavor with some Diet Coke. For the record, that combination was even worse. But one thing that was noticeably missing from these extra hot pepper drops was the hot. "They weren't hot at all," he confirmed, "I couldn't taste anything past the bad. Which, by the way, is still going -- this is like a Jäger shot that just won't end." As for the others, the general consensus was "awful", "terrible", and "seriously, people eat this stuff?" 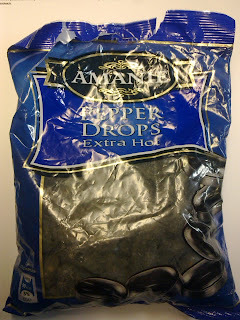 But as far as pepper drops go, Amanie is no Pirkka, but they still are inedible. Look for the other two other reviews later this week. 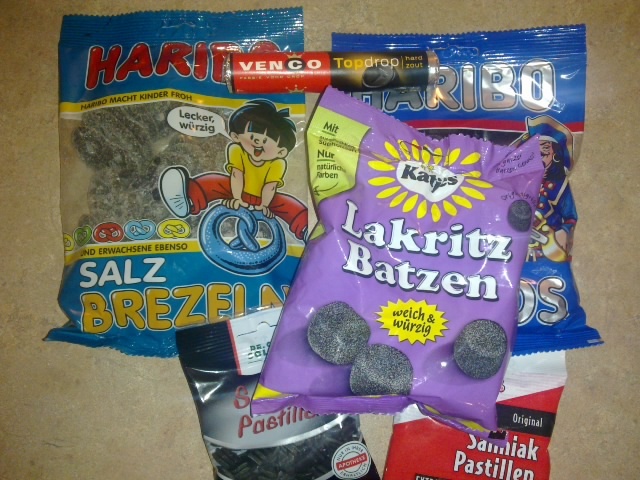 Also, I picked up a small batch of some fresh, salty licorice at a German grocery store nearby where I'm staying. We have a delightful chain of stores here in the states called World Market. In addition to fun home décor and furniture, they sell treats and candies from around the world. They’re usually a pretty mild versions – for example, they don’t stock sugared, freeze-dried squid snacks – because, as Americans, we want to feel like we’re doing something exotic… not actually do it. 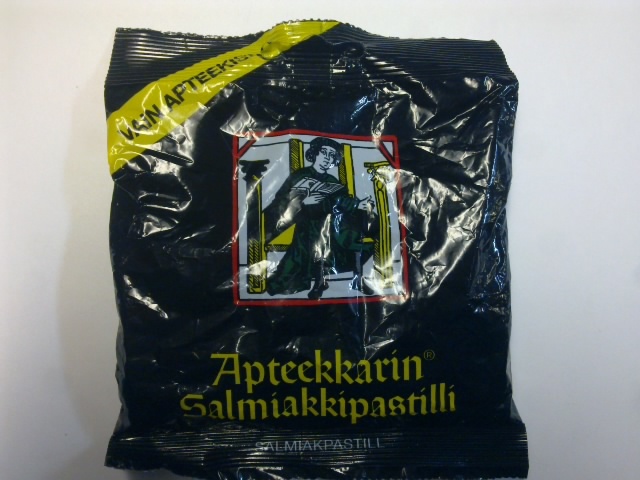 So I was a bit surprised to find actual salty liquorice at the store. It was probably a mistake on the part of World Market’s buyer, as I’m pretty sure there’s an import ban on the stuff. Or, at least there should be. 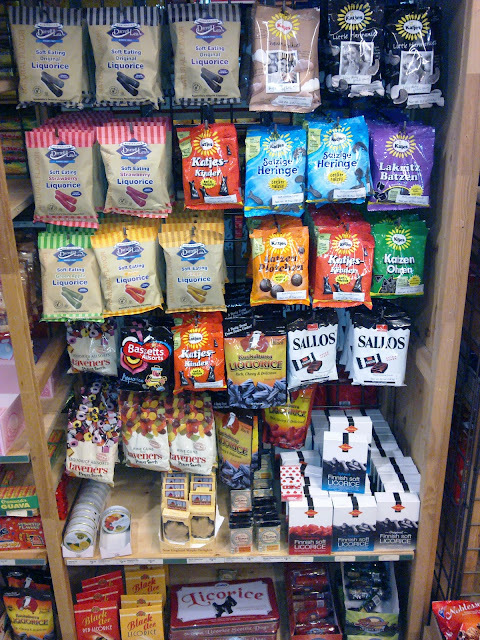 The salmiac was hidden among other foreign-looking liquorice. 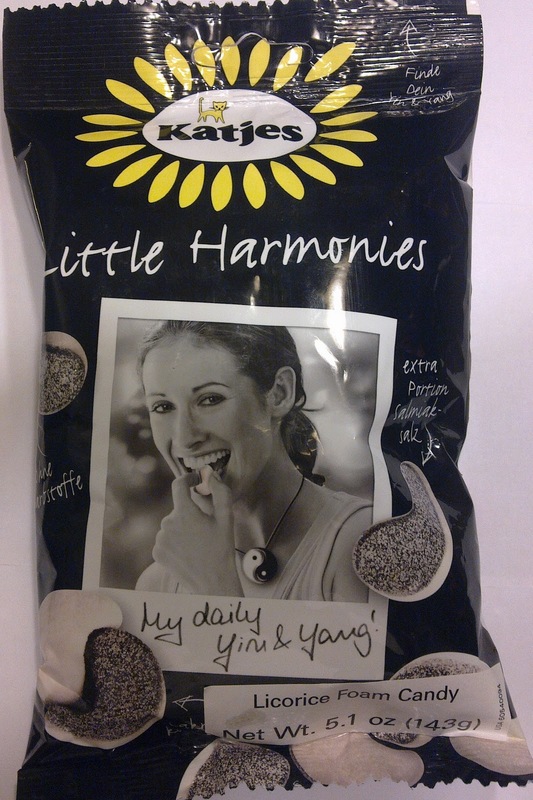 Like most of Katjes products, Little Harmonies look harmless. 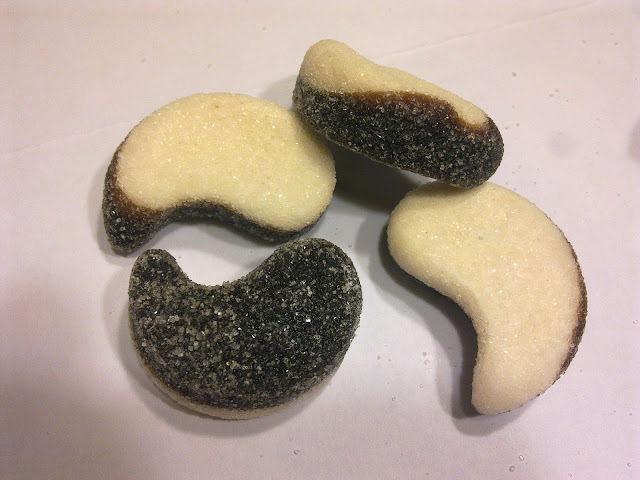 The cheerful model on the front even proclaims it, “My daily yin & yang.” I could see how a foreign-candy buyer might get confused. This actually looks like real candy. Opening it up revealed a spongy-textured teardrops of salty liquorice and... whatever the heck the white stuff on the other side is. My experience with Salmiac has taught me to fear candy that looks sugar coated, so I was a bit reserved when I took a bite. But it actually was sugar. The texture was a bit strange - somewhere between a marshmallow that has been left out for two days and a gummy bear - but it was not unenjoyable. As for the taste... it was really difficult to pin down. 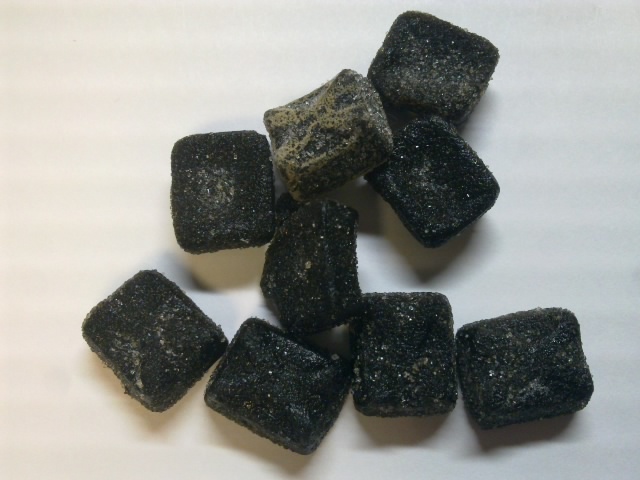 There was some salt and some liquorice, but it was all very muted. I suspect that's a result of the fluffy texture. All in all, I can't say that I liked them... but I didn't dislike them. Therefore, I'll award them the bland edible tag.